"Even if we succeeded once and/or twice, we had better not say arrogantly that we "learned the technology" or �gestablished the technology�h. The budget should be increased to "succeed in it once again" if succeeded. The budget should also be increased to "launch it more" if failed. I expect the time that the space development of our country become genuine would come, by applying such an extremely natural law learned through experience to the space development." Satellite 2005 Conference & Exhibit with Reception for SSPI GaLa Hall of Fame was held in March 22~25 2005 at Washington Convention Center. More than 6500 registered attendees were present. Exhibition also was held with 220 exhibitors including 51 new companies. In this year, SSPI Hall of Fame are given to five celebrities include Japanese Mr. Yoshida who have contributed for Commercial Satellite Operator and. Foundations. "Originally, I was a microwave engineer specializing in every kind of microwave devices development. 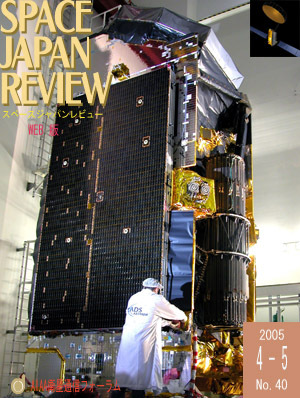 However, last half of NTT Labs and at Mitsubishi Electric, I worked for satellite communications systems development. After 1997, in the university, I have been striving to develop principles of the DSP communications satellites systems design." Prof. Egami of Shizuoka University, Japan introduces his research activities at the Education Corner.